Terrence McNally’s Jazz Age Portrait Perfect for Now! In tears at times, we feel invigorated by this complex, nearly seamless production. 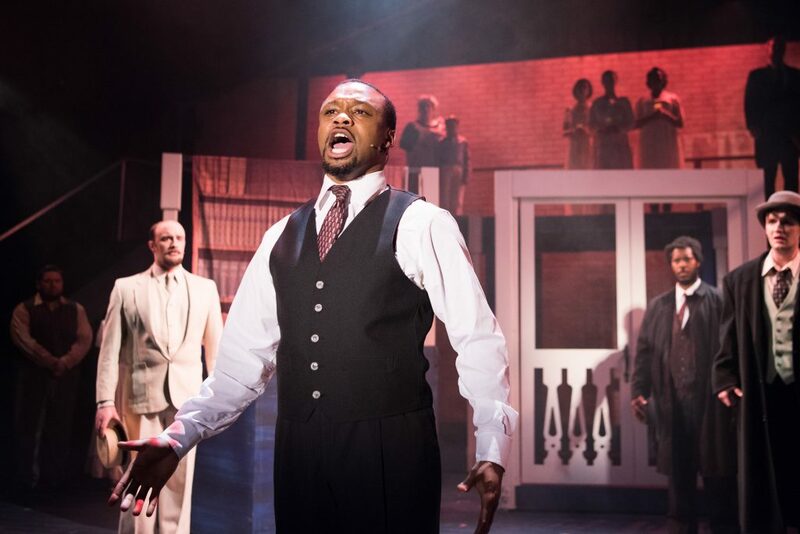 Director William Hodgson brings “Ragtime” to the Berkeley Playhouse with singing and dancing that evoke optimism, struggle, and jubilation. Fictional characters mingle with historical heroes: Booker T. Washington, Harry Houdini, Evelyn Nesbit, J.P. Morgan, Emma Goldman, and Henry Ford. 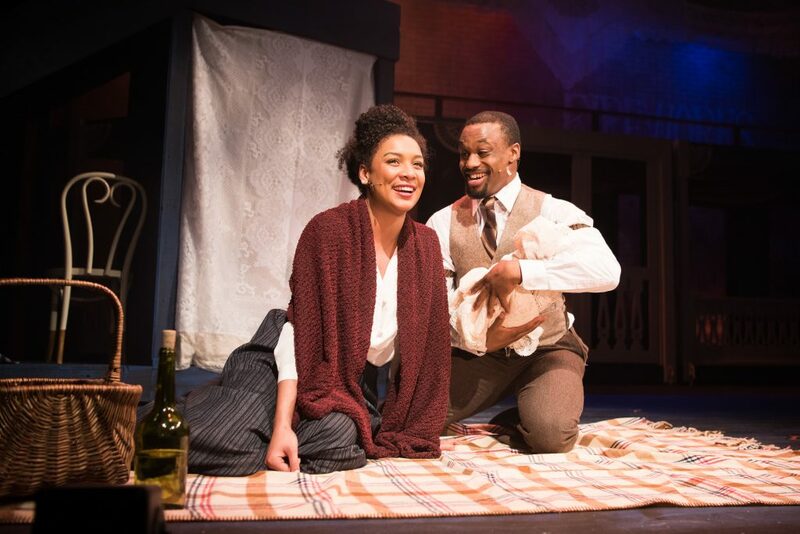 Based on the famed novel by E.L. Doctorow, with show book by Terrence McNally, “Ragtime” takes us to three historical sites: first, suburban New Rochelle, New York; then to the African American Renaissance in Harlem; and then to the immigrant tenements of Manhattan’s Lower East Side. It’s New York in the early 1900s springing to life in front of our eyes. The show opens with one child’s open hand reaching to another, with the reassuring words “It’s OK.” But everything is not OK at all, as we soon see. Dave J. Abrams plays Coalhouse Walker, Jr., the Harlem jazz pianist, running the emotional gamut perfectly. Walker shows unbreakable spirit and will, as he confronts almost constant attacks and abuse, leading to an amazing and tragic series of events. 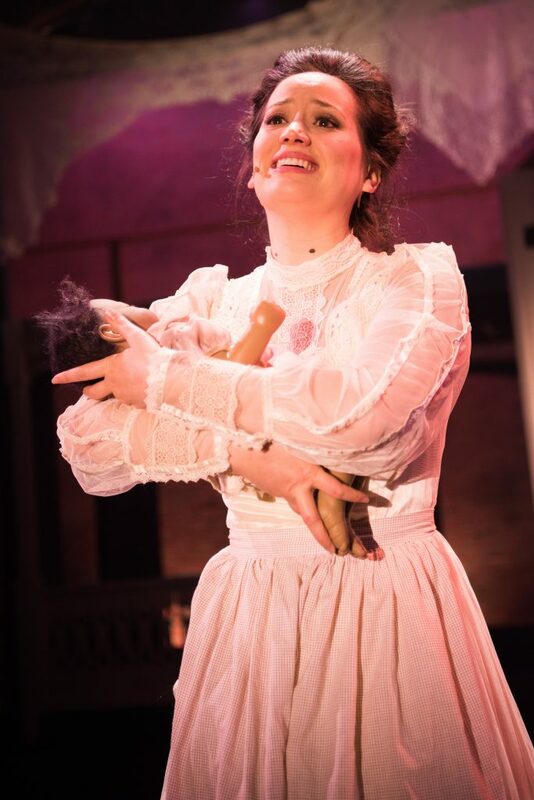 Marissa Rudd plays Sarah, his beloved, belting out a remorseful Blues lullaby to her baby. Rudd sings powerfully about her agony as a single mom and an oppressed Black woman. “Ragtime” conjures up New Yorkers who try to reach across cultural divides, while others struggle to keep themselves separate. In the musical, parents or guardians of children are the most inclined to understand their shared humanity. 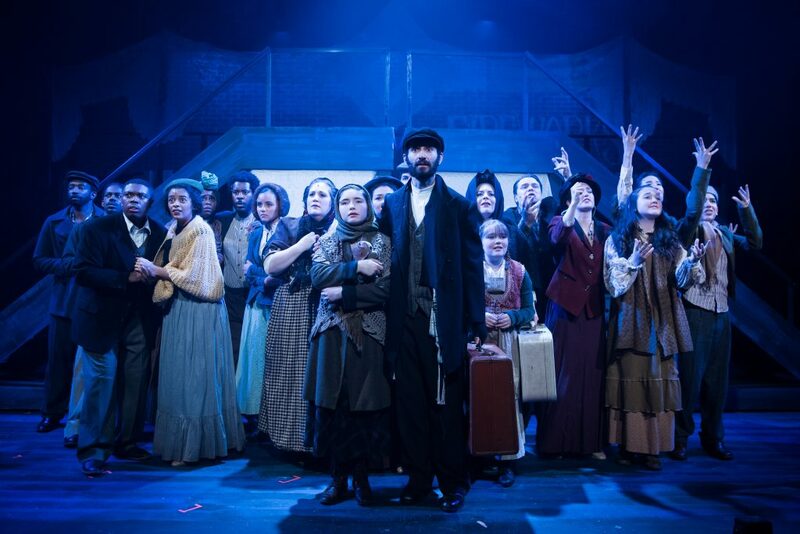 The song “Our Children” unites “Tateh” (Mischa Stephens), the poor immigrant Jewish man, with “Mother” (Mindy Lym), a well-off Christian woman. 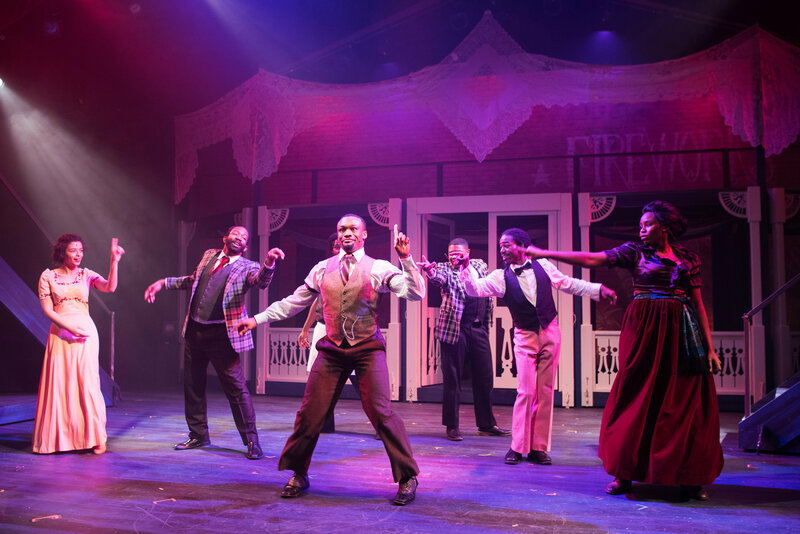 “Ragtime” gets bigger than the Playhouse stage because so many powerful peformances flash in front of our eyes. Add the excellent writing and complex, effective staging and lighting to make a major hit. The orchestra and especially the piano work critically to create a Jazz Age mood. COALHOUSE WALKER JR Dave J. Abrams, BOOKER T. WASHINGTON Anthony Rollins-Mullens, SARAH Marissa Rudd, SARAH’S FRIEND / HARLEM WOMAN Jacqueline Dennis, BLACK LAWYER / HARLEM MAN #3 Johnny Davison, PAS DE DEUX / ENSEMBLE Chanel Tilghman. 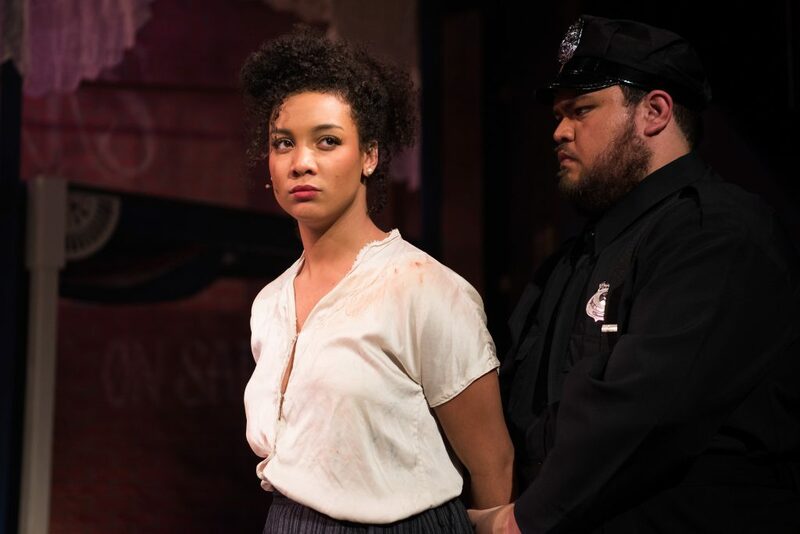 HENSON / HARLEM MAN #2 Marcel Saunders, CLERK / HARLEM MAN #1 The T, YOUNG COALHOUSE (New York Cast) Joshua Hankerson, YOUNG COALHOUSE (Atlantic City Cast) Samara Minor, ENSEMBLE (New York Cast) Sofia Prieto-Black, ENSEMBLE (Atlantic City Cast) Anaya Matthews. TATEH Mischa Stephens, EMMA GOLDMAN Jessica Coker, HARRY HOUDINI / REPORTER #1 Jaron Vesely, CHORINE / ENSEMBLE Ji-Yun Kim, KATHLEEN / ENSEMBLE Courtney Merrell, WELFARE OFFICIAL / ENSEMBLE Keala Freitas, MAN / CONDUCTOR / UMPIRE / BARON’S ASSISTANT Ted Zoldan. BRIGIT / 1ST TOWNHALL BUREAUCRAT Briel Pomerantz, ENSEMBLE Serene Hammami, LITTLE GIRL (New York Cast) Emma Curtin, LITTLE GIRL (Atlantic City Cast) Molly Graham, ENSEMBLE / NEWSIE #3 (New York Cast) Simon Bhueller-Riordan, ENSEMBLE / NEWSIE #3 (Atlantic City Cast) Khoa Sands. FATHER Brian Watson, MOTHER Mindy Lym, MOTHER’S YOUNGER BROTHER Sam Jones, EVELYN NESBIT Andrea Dennison-Laufer, WILLIE CONKLIN / FOREMAN / POLICEMAN / FORD / CANDIDATE Matt Davis, GRANDFATHER / JUDGE / D.A. WHITMAN Don Hardwick, J.P. MORGAN / ADMIRAL PEARY / WHITE ATTORNEY Scottie Woodard. 2ND TOWNHALL BUREAUCRAT / ENSEMBLE Abbey Williams-Campbell, LITTLE BOY (New York Cast) Elijah Cooper, LITTLE BOY (Atlantic City Cast) Joe Krenn, DANCING GIRL / NEWSIE #2 / ENSEMBLE (New York Cast) Evie Mitchell, DANCING GIRL / NEWSIE #2 / ENSEMBLE (Atlantic City Cast) Orelia Oiknine, ENSEMBLE / NEWSIE #1 (New York Cast) Charlotte Curtin, ENSEMBLE / NEWSIE #1 (Atlantic City Cast) Ellie Broscow.